Every team had to play a 4 game regular season before the playoffs. There were 2 conferences. Each conference had 3 teams, and the 2 teams with the best records in each conference would advance to the playoffs. The winner would advance to the final. DCZ Finest went 4-0 in the regular season (advanced), sweeping Newark AND Philly (we played these teams twice). Newark had an 0-4 record (eliminated). Philly had a 2-2 record (advanced). Strong Island went 2-2 in the regular season (advanced). Brooklyn went 2-2 (advanced), and Yonkers went 2-2 (eliminated). Brooklyn and Yonkers played a 5 minute tie breaker in which Brooklyn came out on top. 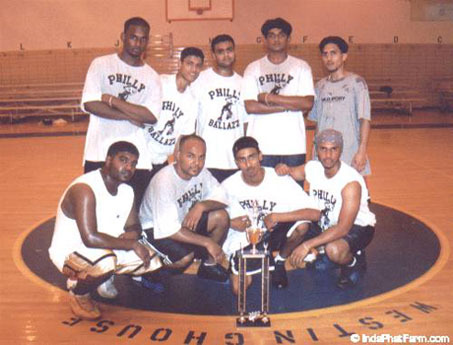 Only one team advances in playoff games, so the tension on the court for the DCZ Finest vs Philly showdown was palpable. DCZ Finest started out with solid shooting/rebounding. But as Philly showed throughout its run to the championship, you always keeping fighting back. Philly got clutch shooting from its PF Binu. Philly didn't beat us by much, but in the end, all that matters is the scoreboard. Final Score: 34-32, Philly advances to the final. The Strong Island vs Brooklyn game was a battle for NY supremacy. Strong Island, in the end was just too much. But Brooklyn did put up a fight. They were even up by 4 pts at one stretch, but in the end, Brooklyn fell. To most observers, Strong Island looked like they were going to take home the trophy. And then there were 2. Strong Island vs Philly. Strong Island immediately came out with solid shooting and built a healthy lead. Philly came storming back though, and by halftime Philly was up. The second half was packed with tension as Strong Island began to realize that the loser goes home. Players/Coaches were yelling from the sidelines for Strong Island to step it up, but to no avail. This was Philly's year. 5, 4, 3, 2, 1...its over. Final Score: 43-33, Philly takes the championship.